Peter Stanway Exhibition In Mijas | Marbella Marbella – Adelante! Peter Stanway’s short Auto Biographical introduction to his life and works. My desire to journey started as a young boy. I even dreamed of going on journeys. I started hitch-hiking around the UK at the age of fourteen and on my sixteenth birthday I was waiting at the ferry point in Dover England armed with my first passport that would allow me to journey throughout Europe. Over my teenage years I journeyed through Belgium, Holland, Germany, Switzerland, Italy and France. My journey into adulthood took me to the Glasgow School of Art where I studied Fine Art and Mixed Media. I was disillusioned there by the pervading apathy among the students. After leaving Art School my life journey took me into a career as a photographer. I set-up my first professional studio in Glasgow and quickly progressed from general photography to working mainly with the pop/rock culture in the UK and with the mainstream London-based music tabloids Sounds, Melody Maker, Smash Hits and Noise etc, often covering their main feature for the front and centre pages. Altogether I worked with over five-hundred different bands including some famous bands like Spandau Ballet, U2, Simple Minds, Haircut 100, The Bluebells, Altered Images, Culture Club, Toyah, UB40 Marillion, The Clash, The Jam and many Inde and punk bands like The Fall, The Exploited Blancmange, The Anti-Nowhere League, The Birthday Party, The Associates to name a few. After having Arts Council backed exhibitions of my photographs from that time in galleries in Scotland and England it was time for a change. I arrived in Cordoba Spain in 1986 and spent over six years living and journeying extensively throughout southern Spain. 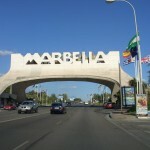 I lived in Cordoba, Alhaurin el Grande, Torremolinos, La Carihuela, Antequera, Fuengirola, Marbella and Mijas. During that time I took up fine art again. 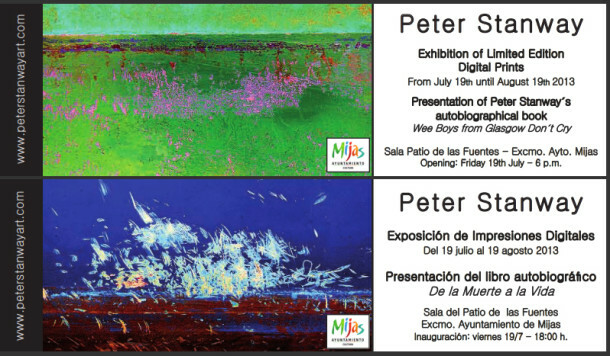 I had exhibitions in La Victoria and in La Conquista in the province of Cordoba. In 1993 the journey of my life took a completely new direction. I trained for Christian ministry and in I997 until 2005 I worked as a full time minister in a church back in Glasgow. During that period I formed a Christian charity. The work of the charity allows me to journey to and through countries all over the world Nepal, Kenya, Rwanda, Uganda, Pakistan, India, Israel, Philippines, Mexico, Argentina, Chile Paraguay, USA, Denmark, Holland, France, Italy and Spain. For twenty years or so I put aside my art but I believe that with this touring exhibition another journey has begun and I am excited! I am planning that it will travel extensively visiting many places along the Mediterranean coasts of Spain France and Italy. I am fascinated by how the world around us is in a constant state of flux by how it is forever changing quickly or slowly by nature and / or by man’s intervention. I am working from source images that no longer exist. They are transitory captured for a moment in time giving us a fleeting glimpse of something that we may otherwise miss. I would love you to accompany me on this journey. Please use the poems that complement the images. You will find the poems alongside the description of each image in my shop (tab above). The poems are portals to help you to climb inside the images to have a look around. *Read my full autobiography Wee Boys from Glasgow Don’t Cry.